For those of you who have a air temperature above 0 degrees Fahrenheit, count yourself lucky. We are just ending our second week of below zero temps. It was -14° this morning. Our dog "Daisy can go out, do her business and be back in in less than 1 minute. The first few days I didn't mind too much. It was nice to stay in and applique. After too many days of this weather, I'm experiencing cabin fever. Yesterday we managed to get out and go to Des Moines shopping. We didn't want to come home when we were done. I miss going for walks each afternoon with my husband and our dog. Hopefully by the time you are reading this our weather will be warmer. There are a couple of really fun things in my newsletter this month. I am beginning a new, free BOM called "Connie Sue's Sketchbook. There will be 100 - 6" blocks in the quilt. I'm also starting a new series on how to do the Quick Prep Method of Applique. Enjoy. 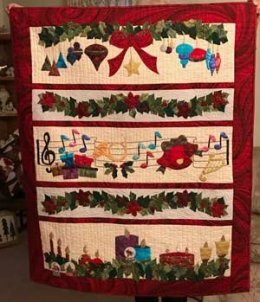 Karen Johnson's - "Ann's Lyrical Christmas Quilt"
Karen Johnson and I have known each other almost from birth. Our families belonged to the same church and our mothers were in the same Ladies Aide Society. When we were young our mothers took us to meeting and we played together. Currently Karen is "retired" from the Gingerbread House (her quilt shop). That doesn't mean she isn't quilting. To the left is her version of "Ann's Lyrical Christmas". Karen is also stitching along with me on my next free BOM. She has over 46 blocks done. Great job, Karen and thanks for your help. 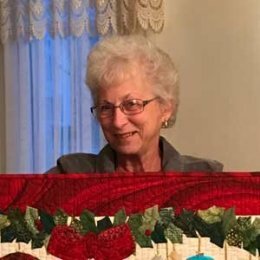 I have been wanting to present lessons for my Quick Prep Applique Method for a long time. Life does have a way of interfering, however. First I helped care for my mother as she suffered through the final stages of dementia. Then I helped care for my father through the final stages of his life. Through it all I made mental plans for the lessons I would present. I decided they would follow the outline of my workshop. I would illustrate them with drawings - a real challenge for me. I prepared my lesson plans - in my head. Then waited for the day when I could formulate them into the printed word. I am so please to begin presenting them to you. It is my goal to present one lesson every month. I have to admit that I don't as yet have a firm handle on how many lessons there will be. So I've decided to plunge in and let them develop as we go along. I expect that there will be at least a years worth. The lessons will be presented to you as PDF files. I recommend downloading them and saving them. If you are computer savvy save them to a folder on your computer. If computers are not your thing then print them out and store in a binder. This month we kick it off with a lesson on the equipment and tools that we need for Quick Prep Applique. 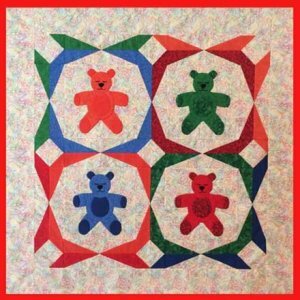 Download Quick Prep Applique - Lesson 1 - Equipment and Tools "Sleep Teddies" - Click here for more info. It's official. We are going to California in the spring of 2019. We would love to come to your guild. Click here to e-mail me and I'll send you a packet of info concerning my workshop and trunk show. If you aren't in charge of booking programs, please forward this newsletter to the individual in your guild who will be planning 2019. It seems so strange to not be publishing a pattern in this newsletter. My newest, free, BOM began on January 1, 2018. The first block was called "Christmas Bells". It will be available to all who have not already downloaded it until January 23rd. I will normally only have a block pattern available for 2 weeks, but for this first week I'm making an exception. You are responsible to go to the download page each week to download a block pattern. I will not be sending e-mails notifying you of this. If you miss getting the pattern for any reason during the initial 2 week period when it is free, starting at the beginning of the 3rd week you will be able to purchase it for just $.50 (50 cents). Click here to go to the download page for "Connie Sue's Sketchbook".